Despite minimal difference between the temperatures in summer and winter, the climate tends to vary a lot from year to year due to the influence of the weather phenomena known as “El Niño” and “La Niña” among others. During El Niño years temperatures tend to go up by a few degrees and during La Niña years they are lower when compared to so called “normal” years. Also precipitation tends to differ significantly in both directions for El Niño and La Niña depending on time of the year. 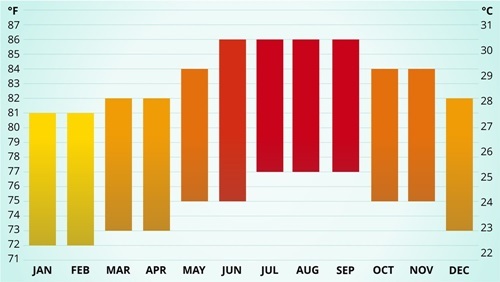 These are the average highs and lows during the year. Any time of the year it is recommended that visitors bring light clothing. Punta Cana, similarly to most tropical destinations, does have a “mosquito problem” and this can be felt especially from May to October. The mosquitoes usually appear after dark, and visitors are advised to wear long sleeved shirts and long pants and to use insect repellent before going outside.